Mystery of the Star cast of ‘Ye Re Ye Re Paisa’ has become the talk of the town. 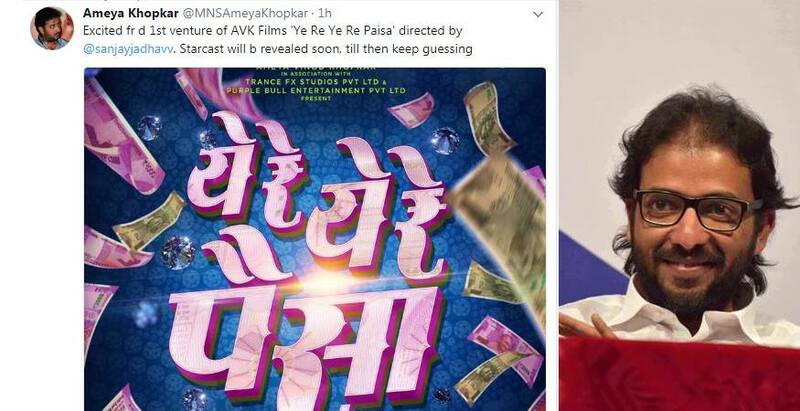 Recently Ameya Khopkar tweeted about “Ye re Ye re Paisa” in which he mentioned about revealing star cast of the movie very soon. Now, this tweet is going viral. The movie will release next year on the 5th of January. Ameya Khopkar is making his debut as a producer from this film. The movie has already started creating a buzz amongst the audience and everybody is very excited to know whether this time Sanjay Jadhav is coming up with new faces or not. One more unique thing we have always noticed about Sanjay Jadhav’s films is that his films titles are always in Hindi, but this time he is coming up with a proper Marathi title. Strange, isn’t it? Ameya Khopkar’s AVK Films has produced Sanjay Jadhav’s Ye Re Ye Re Paisa and he being a part of the Political party MNS and working for entertainment department, the question which pop ups in one’s mind, ‘is he the reason behind it?’ The political party to which Ameya Khopkar belongs, has always emphasizes on Marathi language and hence there can be a possibility of Sanjay Jadhav naming his movie in proper Marathi language.